Service was very lack luster, but thats what I would expect from a place that was very busy on a Sunday, but only had one woman working the counter. When I dropped off the car same lady was the only one doing work out of 5-6 men standing around the office, not what I see when I see a good team working together. She wasnt rude, but her being busy meant she rushed through my check in, didnt ask which insurance I wanted and just gave me the expensive one, also I had to ask about prepurchasing gas from them at the lower rate. She also took a call while I was waiting for her go over details, it was another enterprise branch, instead of putting them on hold or calling them back and dealing with the customer at hand she told me to wait and walked out of the room. I dont mind waiting, but when its my turn its nice to feel like youre having it all gone through and not rushed into paying 2x the original price (her jacked insurance price and not offering me the lower insurance they offer). The car was fine, but I will rent elsewhere for better service. We were late few hours for pickup the van, and we forgot to call, as per their policy, after 1.5 hours they gave out our reserved van. Matthew was very courtious and helpful, he explain to us about giving away the car. But then he went out of way to save our day. He offer to give us 2 cars instead the van, but that wasnt the option for us. He then offer us Mercedes at even discounted rate. He even offer us free airport drop off. Very great experience. Exceptional service even during busiest Canada Day weekend. Highly recommend this Enterprise location. I was visiting from USA and rented a car at this place. Had to wait for a 30 mins as the car was not ready and later realized the fuel tank was only half an I realised it only after driving the car for 30 mins. I still give it a 5 star rating because I had a very positive and very friendly experience. My car was upgraded with no charge, without even asking even ask for it, and the fuel issue was taken care by just a short call. I had the pleasure of dealing with Githin the branch manager. I wanted to do a switch on my rental and as easy as that may sound, Ive had past experiences that would tell you otherwise. Githin was friendly from the get go and assured customer satisfaction, thanks for doing what you do best. You wont be dissapointed, give him and his team a chance. The building isnt much to look at but the staff, service and quality of vehicles more than make up for it! Ive rented twice in the past month, once for 2 weeks, once for 2 days. I was professionally and happily attended to by Mustafa and Thomas, both of whom were personable and friendly throughout. I recommend this place. Rented a 24 car to see Whistler, I dealt with Sid and the whole experience was great, excellent price, no hidden charges, they picked us up from the ferry and would have dropped us back if we wanted. We requested a GPS and when it didnt work properly they refunded us no questions asked. Would use these guys again. Worst service ever. For example, Ive been on hold for 20 minutes and I am still on hold. Before that I was given their "direct line" which they never answered and I got transferred back to their national dispatch twice. So disappointed every time I have to call. The gas tank was near empty when I got the car. I picked up the car half an hour early and returned it on time, and they warned me about returning a car half an hour late :D said "I cant happen every time sir"
My boyfriend and I wanted to rent a car for one day and pay with my credit card but it was not acceptable for them so we were not able rent a car from them. Good that there are other car rentals fairly close. Very courteous and hospitable staff. Didnt wait very long to be set up. They gave me a free upgrade.But one star less because the car was not clean enough. Received great and courteous service, price was right and enjoyed the whole experience in North Vancouver. 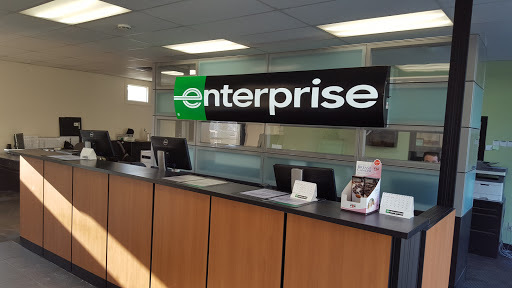 Thanks to Enterprise for a job well done. Very patient and understanding - the manager was great. Professional unrushed service even though we turned up just before they closed! Thank you! We rented a car for a Canada wide road trip. These guys were very professional and helped us out a ton on making our trip affordable. Amazing staff here, you simply have to visit them to experience what I mean. These guys will take good care of you. Hank went above and beyond and got me into a beautiful Mercedes Benz CLA. Good job and keep it up! Friendly staff that are willing to work hard and make the customer happy.